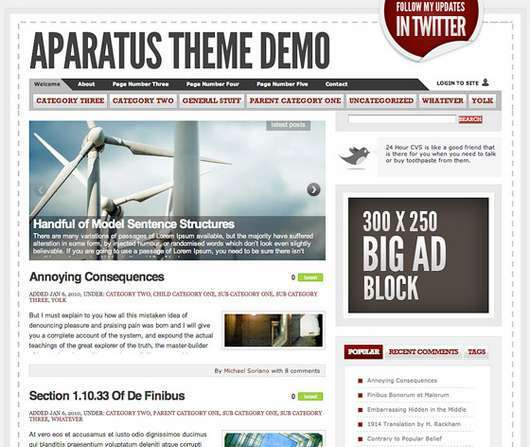 As you probably know, apparatus is a free premium WordPress theme that comes with a Moo tools slideshow in the home page. This theme has many features and great designs that will not only make your website look lovely, but also offer your website a great appearance. This theme is one of the most popular themes on WordPress. You can also look around the internet and try to identify the sites or blogs that have used this theme.This theme is free on WordPress and it can be used to as many domains as you want. It does not matter if the domains are yours or other persons. The theme has been tested and it is compatible with the latest version of WordPress. 1. The free version: a majority of people use the free version, especially bloggers. 2. The standard version: people who are doing personal projects that require presentation use the standard version. Even though this version has a one-time fee, the difference between the free version and this one is very small. 3. The developer version: the developer version is the best version that anyone could use. This version is the best when you are doing clients projects.